Need plants for murky soils that drain poorly? With our clay soils, the answer is probably “yes” for at least part of your yard, especially when we have a rainy year such as this one. Fortunately, there are more plants available for this problem than you might think. This is a culled-down list of plants for different uses in the landscape. Unless specified, these are plants for damp areas—clay soil that doesn’t drain well—not necessarily bogs or constantly wet soils. 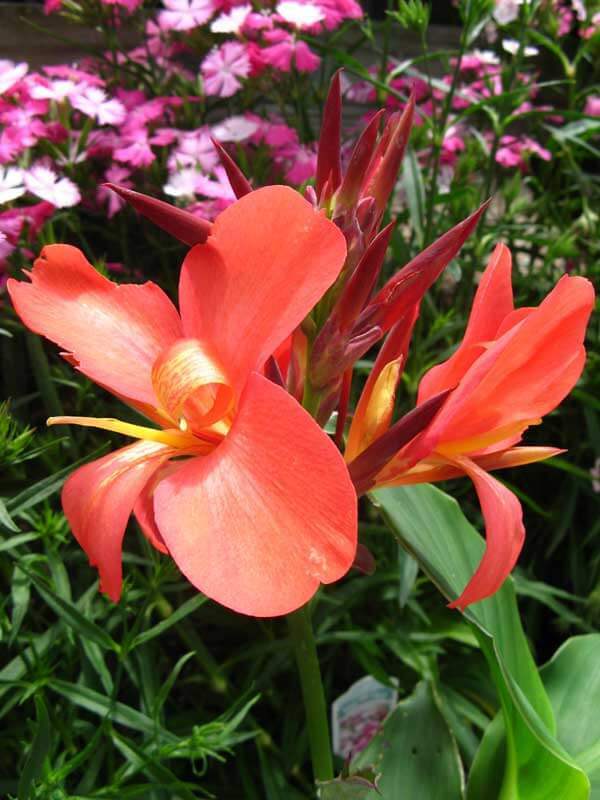 Canna Lily (Canna x generalis) – Known for the bright orange, yellow, pink, white, or red summer flowers set atop lush, tropical-style foliage. The foliage is a show in and of itself, usually green or burgundy but often striped with yellow and/or orange depending on the variety. Cannas can also be planted in bogs or pond edges. Grows to 3-5 feet in full sun. 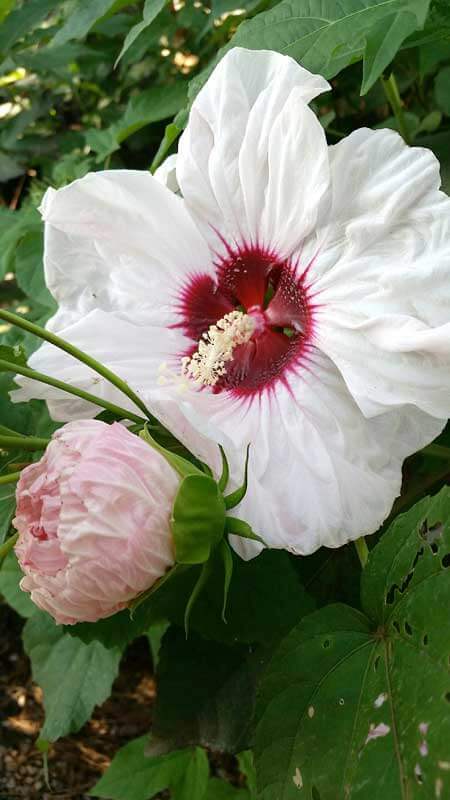 Perennial Hibiscus (Hibiscus moscheutos) – Bombshell blooms the size of small plates explode in red, white, and pink in the summer landscape, usually July through fall. Dwarf forms average 3-4 feet tall and wide while the regular varieties top out around 6-8 feet tall and wide. These will also grow in swampy areas. Plant in full sun. Sweet Flag (Acorus gramineus) – For those who want something diminutive that doesn’t take over the planet there is sweet flag. Tidy fans of golden, grass-like foliage form neat mats at the base of plants or the edge of a walk or border. Sweet flag is low maintenance and evergreen. It can be grown in bogs, as well. Plant in sun to part sun. Creeping Jenny (Lysimachia nummularia) – Golden chartreuse coin-shaped leaves hug the ground to create a pretty, mostly evergreen, groundcover in damp or wet areas. Watch where you plant it because it can invade a lawn. Plant in sun to light shade. Beautyberry (Callicarpa sp.) 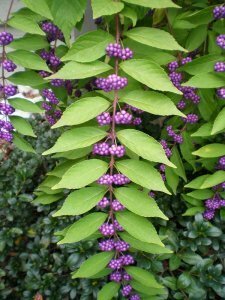 – In late summer, the arching drifts of foliage are intersected with clusters of violet-purple berries along the stems of this shrub. White-berried, and occasionally pink, forms are also available. 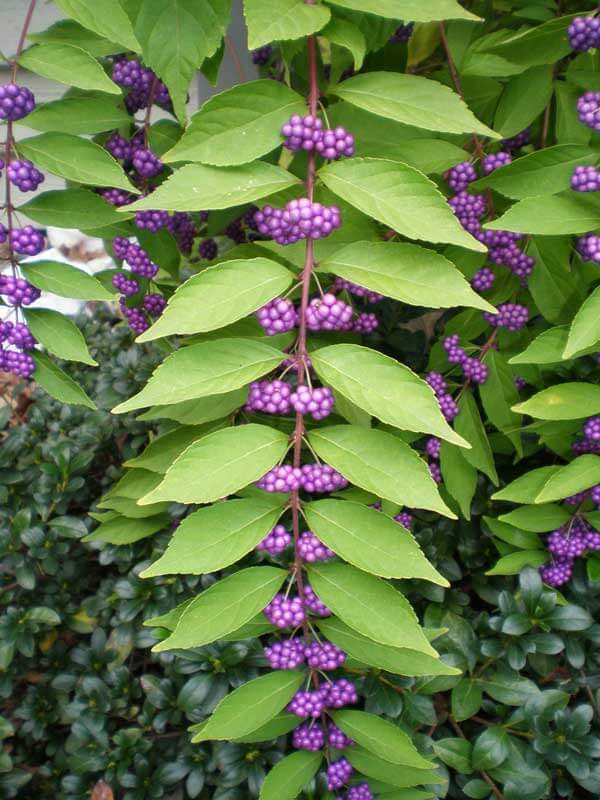 Beautyberry is always a charming stand-out in the landscape. Easy to grow, it reaches about 3-4 feet tall by 4-5 feet wide. Plant in sun to part sun. Winterberry Holly (Ilex verticillata hybrids & cvs.) – This is the plant to grow if you love brilliant red berries gleaming in the winter landscape. Unassuming when not in fruit, mature specimens in the berry season are stunning. It requires that you plant a male and a female in order to get fruit. Generally grows to 6-10 feet tall and wide in full to part sun, and will accommodate wet soils, as well. Dwarf Yaupon Holly (Ilex vomitoria ‘Schillings’ or ‘Bordeaux’) – Sometimes you just need a compact, low-maintenance, easy evergreen for the front of the house. For poorly drained areas, this well-behaved plant is a neatniks dream. Grows to about 3 feet tall in sun. 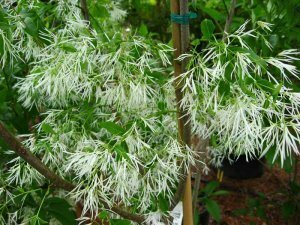 White Fringetree (Chionanthus virginicus) – This is a lovely small specimen tree that is also excellent in groups. White, fringe-like flowers bloom like a soft snow from May to June. Grows about 12-20 feet tall in sun to part shade. River Birch (Betula nigra cultivars such as Dura-Heat or Heritage) – Makes an exceedingly handsome specimen tree, often planted in forms that include 2-3 trunks. Appreciated for its exfoliating bark that curls off in layers of buff, cream, salmon, and cinnamon, and for its lacy curtains of foliage that hang from arching branches. Southern Magnolia (Magnolia grandiflora) – This is the classic southern magnolia that boasts shiny evergreen foliage with fuzzy, cinnamon-brown undersides, and which is beloved by many a Southern holiday home decorator. Gorgeous, massive, fragrant white flowers appear in late spring to early summer. Dwarf forms such as Teddy Bear and ‘Little Gem’ grow to about 25-30 feet tall, while ye olde magnolia varieties can grow to 60-80 feet tall in sun. For more ideas, here is a list of honorable mentions perfect for heavy clay and damp soil. Featured image Canna lily / Homewood Nursery. Tina Mast is communications director for Homewood Nursery in Raleigh and can be reached at [email protected] or at 919-847-0117. For more ideas, check out their list of plants for damp areas on their website at homewoodnursery.com. Or click on the Gardening Info button on the desktop website or Free Garden Guides button under More Options on the mobile website.